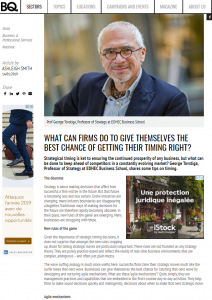 WHAT CAN FIRMS DO TO GIVE THEMSELVES THE BEST CHANCE OF GETTING THEIR TIMING RIGHT? "[...]Given the importance of strategic timing decisions, it does not surprise that amongst the new rules cropping up, those for timing strategic moves are particularly important. These rules are not founded on any strategy theory. They are purely practice-based and reflect the reality of real-time business environments that are complex, ambiguous – and often just plain messy. [...]"